In other parts of the City, the underground tunnels and complexes have also been refitted for public use. 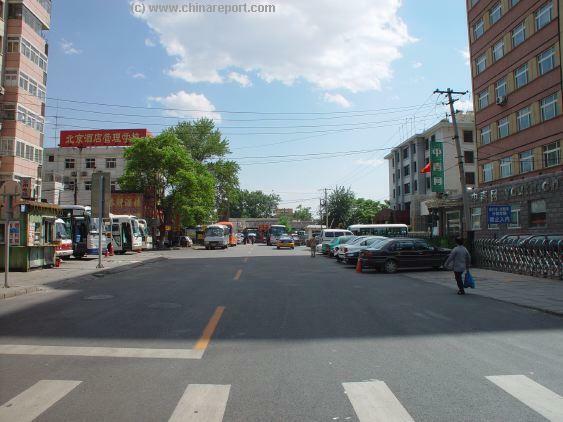 These include an entry somewhere at 18 Dazhalan Jie', Beijing's Famous Shopping Street just across the Xuanwu District Border, and The Beijing Qianmen Carpet Factory located at 44 Xingfu Dajie', Chongwen District, inside the Tunnels. The Underground City, hidden under most of Beijing, is a relic from the Cold War Era and the 1950's/1960's tensions between China and the Soviet Union. Once a secret air-raid shelter network expected to protect 40% of the Beijing Public inside underground Tunnels from a devastating nuclear attack, it fell into dis-use after the late 1970's. After the Cultural Revolution and with the advent of modernity in China, it was soon forgotten by most Beijingers and remained a site virtually unknown to the Cities Citizens until at least the year 2000 AD. Meanwhile, it was a modest tourist attraction, only popular with Foreign Tourists. 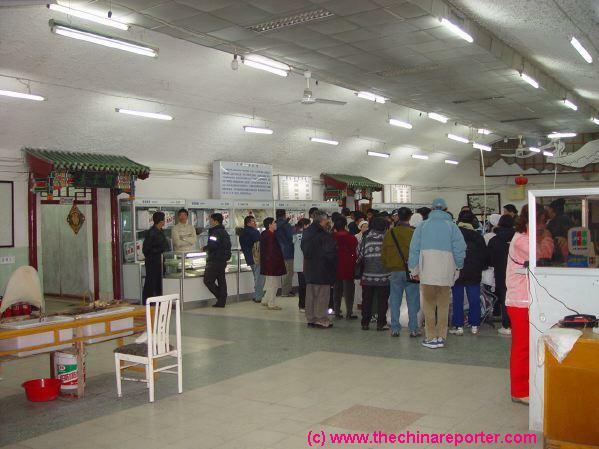 Beijing Underground City can be found in the Chongwen District and has been open to the Public since the early 1970's (See the Book "Inside China Today" , by E. Grey Dimond). Currently it is a popular tourist attraction. 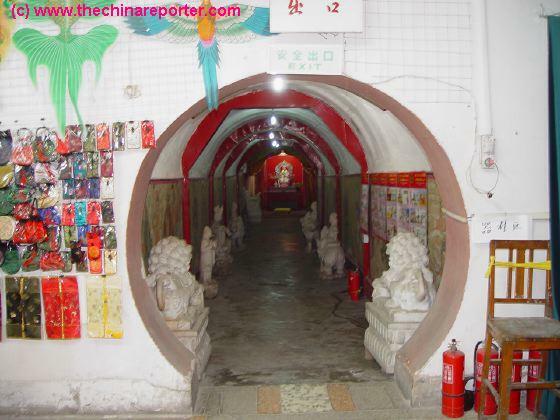 The Entrance to Beijing Underground City (Museum) as photographed in November 2002.
into much cooler air , down a a winding stairs in a tiled tunnel with the familiar feel of the Beijing Subway. This is probably not a coincidence at all. Earlier during my 2002 stay in Beijing i had noticed how the Subway Stations , Entries and Underpass at the North and South of TiananMen seem to have blind exits and an unusual array of doors. These were especially obvious since during the (Historic) 16Th Communist Party Congress all stations, including blind tunnels and doors, were guarded by Security Police. The conclusion that the Beijing Subway and the "Underground City" are closely connected is obvious. Multiple historic sources, among whom one of Mao's personal physicians have confirmed this and other stories ( see J. Spence " Mao " ). A Map shows us where we are now and where some of the tunnels in the vicinity lead. Left on the map the Underground City complex. 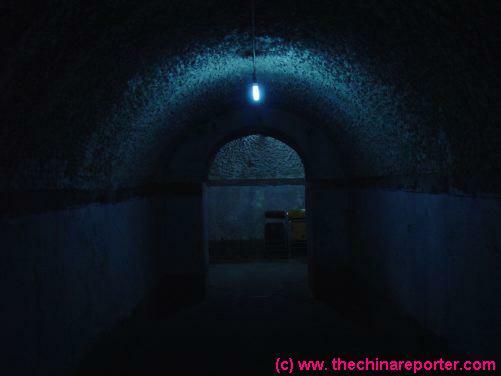 It shows that some small tunnels lead from our part southward under the Hutong. 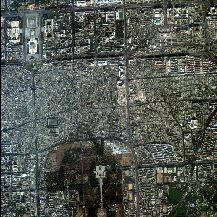 Westward , it shows, the complex extends toward and under Qianmen, which is at the South-side of TiananMen Square. Even though Mao felt religion equalled superstition and he has said that religion was backward , his shrine is in the same underground complex as the earlier taoist and buddhist ones. 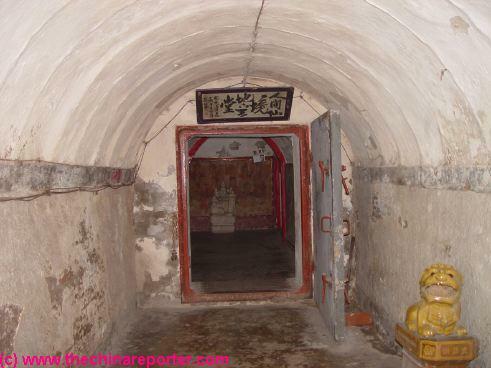 During the Days of the Cultural Revolution 400.000 Beijing Chinese were mobilised to dig these underground tunnels that run for miles and miles under Beijing. Faithful to Communist-Leninist-Maoist-Culture the details on the wall here are testament to the giant struggle of the people. Note how the dirt is carried away in bags attached to (bamboo) poles. Workers are wearing the "Mao-Suit" that was also introduced in this self-inspecting period in Chinese history. Leaving the Underground City with perhaps its most valuable treasure, a depiction of the architects and engineers that worked on the project, we calmly ascend to the same point as we have entered at. Appearing into the Hutong China changes back into modern day times. these tunnelcomplexes are a Great Example. Factories, tunnels, hydro-electrical dams, irrigation-projects, extermination-projects (The 5 plagues) , hoge projects were undertaken, getting more ambitious every year. Everything was needed from the populace so as to lift China to an new industrial level and ensure a better & brighter Future. And politically the main goal of all the strict social rules were to ensure total loyalty and conformation to the authocratic rules. 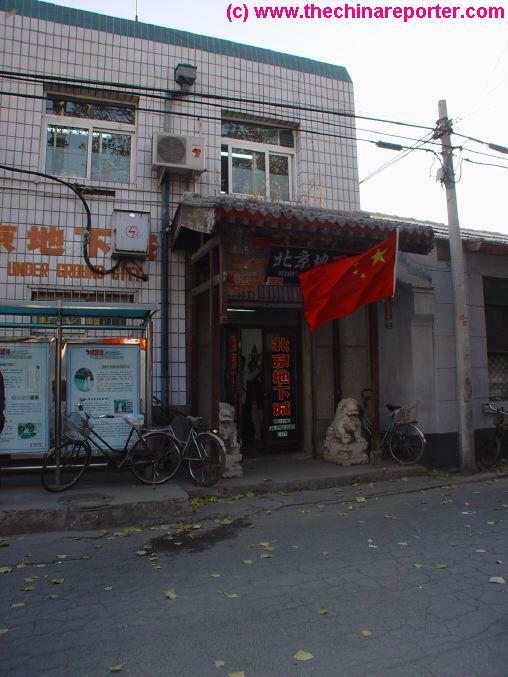 Once through the non-impressing Museum Entrance, enhancing the secretive romance of the place, the visitor finds himself in what seems to be a (very small) Hutong store-front. One would almost excuse oneself and hurry outside for making the mistake of entering the wrong premises. However, this IS the Museum. The next, somewhat wider room is all revealing. There, 2 Older ladies sit behind an old wooden desk with a register. Tickets can be bought and a gaping entry to to an underground tunnel looms. Not before long, some 10 meters down, the tiled subway-like stairs give way to what is exactly what one expects from Underground Bunkers. Two, dark grey, damp, dimly lit holes of tunnels lead away to the Left and Right. Only muffled street sounds can be heard as well as some people chatting above at the entrance. This is the actual thing! 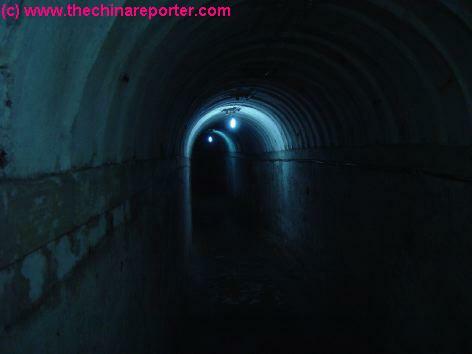 Beijing's Underground Maze of Cold War Era bunkers and tunnels. "Secret Beijing". While snapping away with my Camera, Which is forbidden even with a press-card, Pine complains that I know too much detail about Beijing and China. She says she did not even know this complex existed , and she is Chinese living in Beijing ! With a thorough conviction in her Voice she proclaims that I MUST be a Spy. I am a spy she repeats. Luckily she is laughing. I am laughing too. She does not know it, but she has just added some extra flair to this Visit. For by proclaiming this , she takes me back to the Cultural Revolution Era. In those paranoid days of self-inspection and sacrifice to the State , China was very suspicious of Foreigners. Of course they were all Spies !! And so would i have been when found in this place , photographing it. 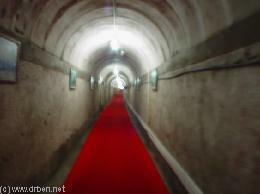 The 1960's era Beijing Air-raid Shelters, or Underground City, extends for 85 Square kilometers under Beijing. From the Qianmen-area the tunnels reach South to Tiantan Park, North-East some 20 kilometers to the Capital International Airport , North-West via TiananMen Square and BeiHai Park to the Summer Palace (Yiheyuan), and West all the way through to the Western Hills and Mao Zedong's nuclear bunker and Military Command Center also known as the Jade Spring Hill (or the Hill with the Jade Spring Pagoda)(Yuquanshan). Apart from the air-raid shelters there is a separate Maze , not part of the "Underground City" , made for special use by the Communist Party. This tunnel, constructed under supervision of the People's Liberation Army , is said to include a 4-lane underground highway extending between the Leadership compound and the Western Hills. Other features are an underground connection between Zhongnanhai (Leadership Compound) and the Great Hall of The Peoples at TiananMen's western flank. 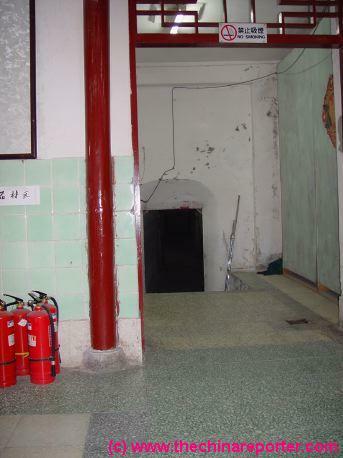 During the 1989 TiananMen Protests the existence of this Tunnel was highlighted in a rather dark way when P.L.A.-soldiers coming from Zhongnanhai Leadership compound appeared on the steps of the Great Hall of The People's and attacked the surrounded crowd from an unexpected direction. During my stay around the 16Th Communist Party Congress China's leaders were not seen at TiananMen nor at The Great Hall of The People's. While the Party conferred inside behind closed doors , TiananMen Square was off limits to every person ,except CNN's Beijing Bureau-Chief , and the Leadership stayed out of sight and touch using the now familiar Zhongnanhai Tunnel-complex to reach the Parliament. Security was maximum. The work, started in the 1960's, became accelerated in 1969 when Soviet Troups seized a disputed island in the Amur River at the Heilongjiang-border. Chinese troups clashed with Soviet Union-soldiers, tensions ran high and war seemed more imminent than ever. Digging was often done "voluntarily" and went on through the 1970's. Virtually every able-bodied man and woman in Beijing took part. Sadly, by the time the gigantic project neared completion in 1976, tensions with the Soviet Union had faltered. When Mao died that year he left behind a country rich in un-realistic, ineffective policies that had burdened the economy into devastation. China had become desperately poor. The New Leadership took the only option available, invoked agricultural reforms ,reversing trends toward collectivation , and halted mass projects among which the Air Raid Shelters. Somewhat Later, new Leader Deng Xiaoping introduced reforms that would start the way to a New China. 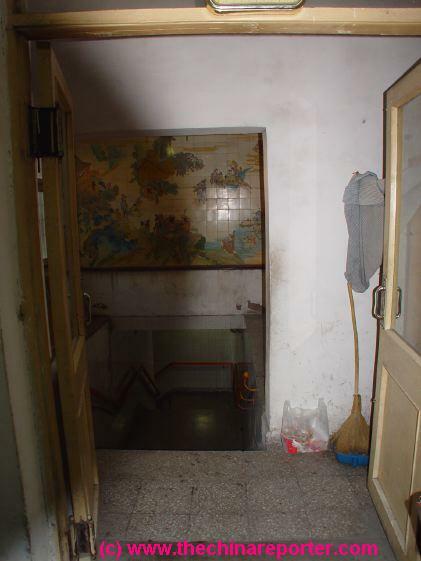 After some 20 minutes and a considerable array of old decrepit rooms holding broken furniture, sealed or half-open rusted doors and interesting signs saying "hospital", "Kindergarten", "Tiantan", and one "Summer Palace" the tunnels open unto small stairs leading into a clearly lit, much bigger room. details of the process. To my astonishment however, I found no English language signs, which is especially peculiar since Chinese Citizens are (2005 - were) discouraged from going inside. The Factory museum displays the art of silk-making , explains backgrounds of the process and of course sells some of their Silkware. They can be found in the Main Meeting Room as well as on display and sale in a small adjacent corridor at the back. The silks were not the worst ever seen. However, the quality of exports is probably higher due to the spoiled taste of most westerners. We leave the Meeting Room therefor without a silken Souvenir, but for those heading to TiananMen Square next, how about getting a Kite ? Kite-flying at TiananMen Square is one of the dreams of many Chinese. The Silk-worm cocoons are boiled, softening and cleaning them somewhat. They are then laid out on a table. After finding a thread of silk, it is taken back and forth and spun across the bamboo rod, during which process the thread should never break so as to produce one smooth cloth of the highest quality. This is a monks-job. The silk-thread thus painstakingly acquired , though soft of touch, is only a very rough material. Exiting the Meeting Room and Silk-museum is done through a brightly painted and lit corridor displaying a miriad of vibrant deities. Bright red mixes with yellow, scathed but lively warrior-like figures dance on the walls and the visitor suddenly finds himself as if entering a Buddhist shrine. Although perhaps not immediatly obvious to the non-chinese visitor, these are not relics of the 1960's era in which this shelter was constructed. 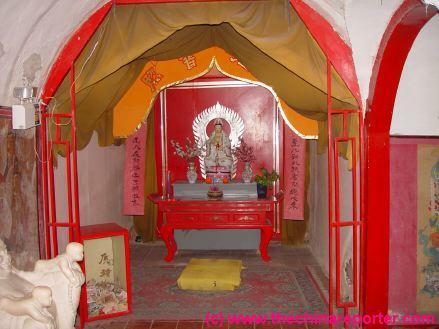 According to www.chinanow.com these Buddhist shrines were installed and erected for the Taiwanese and Hong Kong Tourists who, quoting Underground City-staff, react better to this. 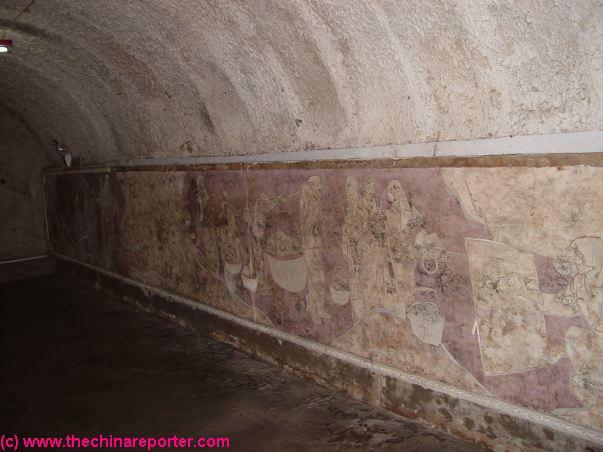 The colorful tunnel-fresco's invoke the Fahai Temple and Dunhuang Grottoes, while the Colorful Altar at the corridors' end holds a Boddhisatva to kowtow too. From the Boddhisatva and the Altar another frescoed but scathed wall leads the visitor through a short corridor to a gaping heavy door. Getting a sense that the end of our Underground City is near we once more enter a wider Tunnel. It leads away around a corner after which the visitor is given one last surprise. 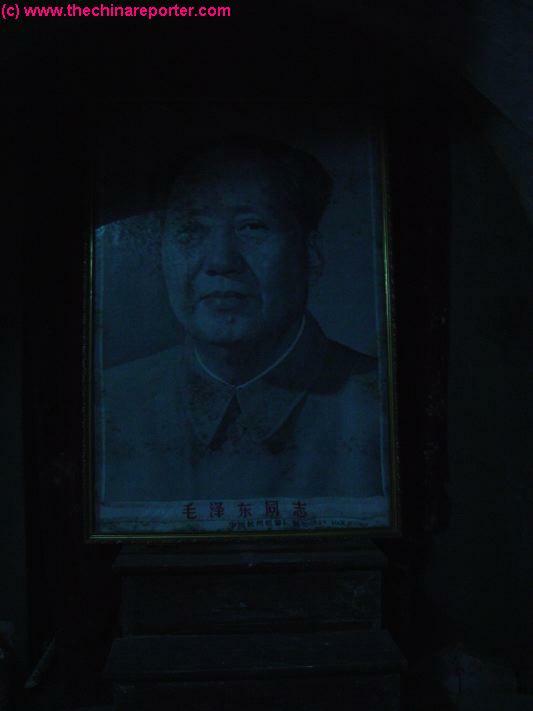 From a small niche in one of the concrete walls an old portrait of Chairman Mao appears. The inscription proclaims "The great achievements and thought of Comrade Mao ..." The rest is indistinguishable. 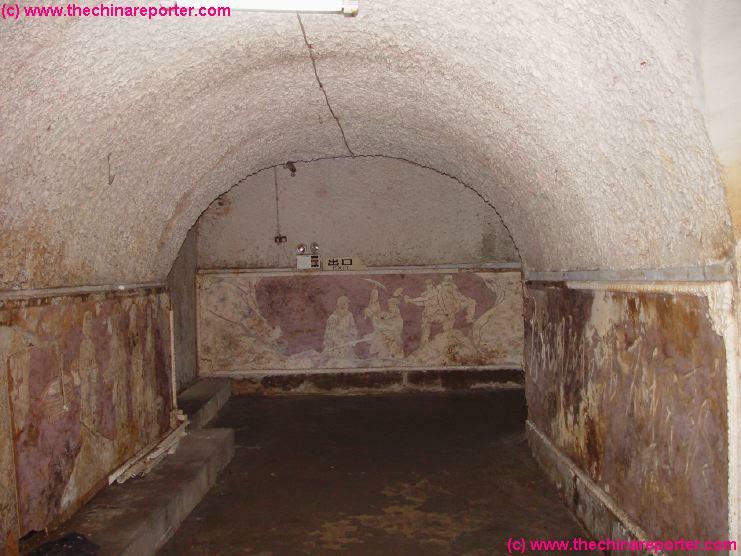 The Underground City of Beijing - How to get There ? 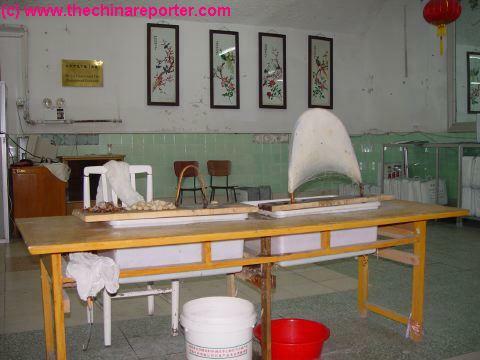 Beijing Underground City Museum is located ín North ChongWen District at Xidamochang Jie', which is a small Hutong road running eastwards , parallel to Qianmen Dongdajie' and some 100 meters South of it. 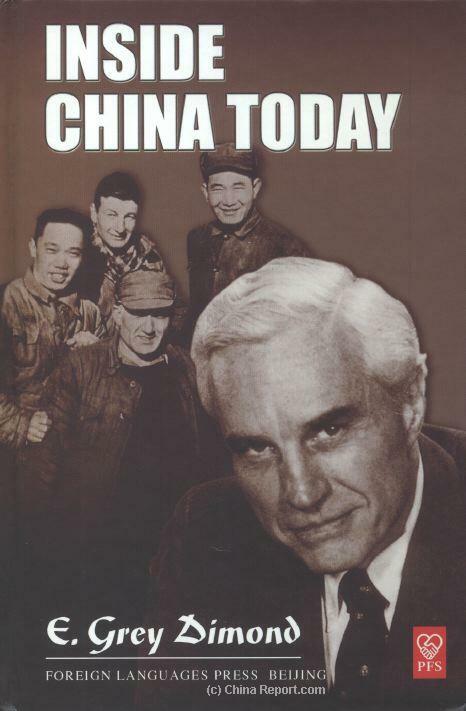 The 1960's were a very turbulent period for the World and for China. At the height of the Cold War, with the Vietnam war raging and tensions with the Soviet Union running high , the country of China had immersed itself in yet another Political Upheaval. This time, after the disastrous 100 flower movement, its paranoid Leadership had triggered the Cultural Revolution and waves of growingly wild ideas were sweeping and taking over the country. Mao Zedong had become a very paranoid and increasingly reclusive Leader. It was during this Time of political correctness , huge development projects and sacrifice for the state that He ordered the Chinese people to "Deeply Dig Caves and Store Food". So that was what was done. All across China, especially in the North-East , large cities started construction on large underground bunker- and tunnel-complexes. 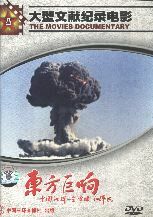 Beijing , Shanghai , Wuhan, and other Big Cities, all were building bunker-complexes to house their citizens and shelter them from nuclear or chemical attack coming from the Soviet Union or the US. In Beijing alone , 400.000 people took part in the construction, which was mainly done by hand. Designed and built to house as as many as 300.000 people, Beijing's Underground City was capable of sheltering 40 % of Beijing's population then. Equipped with housing , hospitals, food storage , clean water facilities and even a cinema, they would sit underground for up to 4 months to ride out the effects of nuclear or chemical attacks. by The Russian Red Army Choir ( CCCP ). Underground City Latest Update : The Underground City has been refurbished, apparently to please the huge stream of incoming Chinese Tourists. With internal tourism booming in China, masses of provincial chinese are now touring their own country. As a result of this mass of tourgroups, many if not all Chinese Tourists sites are now far less pleasant and interesting to visit. On main tourists days such as the October National Holiday one can forget about Photography of Sites. Too many People ! 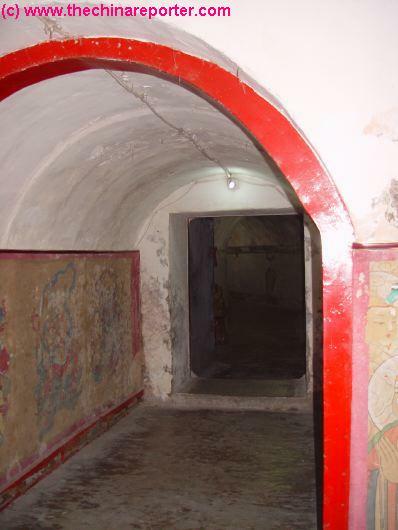 The result for the Underground City is similar - refurbishing the tunnels meant putting on army-patterned cloth-coverings on all walls, thereby blocking view of any details of the Walls. Even worse - 100's of Color Photos of modern Militairy Equipment from China and around the World (completely irrelevant to the bunkers) have been added as a decoration, again to please the incoming stream of Chinese Provincials. Find out more about the Destruction of the QianMen Area Hutong, the Home of Beijing Underground City. 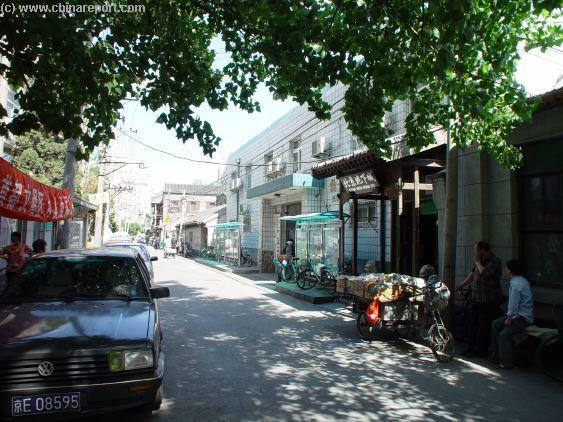 For the creation of a New Beijing, many hutong in the Chongwen District have already been demolished. What is to follow, and what sites will be protected in Chongwen and the Larger City of Beijing ? What will the Olympic City and Future Beijing look like and what will happen to the historic Hutong Area's of Xuanwu and Chongwen ? More information at the Beijing Planning Exhibition and Hall. Standing at East QianMen Boulevard , immediatly East and adjacent of the Old QianMen Station, the Beijing Planning Exhibition Hall is home to a special Exhibition. Find out about the detailed plans for the creation of New Beijing - the Olympic City of 2008 and beyond, the construction of which is rapidly moving ahead. See the new face of the City and walk the huge scale-model ground-plan of Beijing. Marvel at the Architecture of the New ChaoYang CBD and other new Beijing wonders. The Great Leap (Forward) - Communism in the Peoples Century - the DVD Film. Plastic Signboard on a hutong alley wall pointing the way to the Underground City (in 2005). 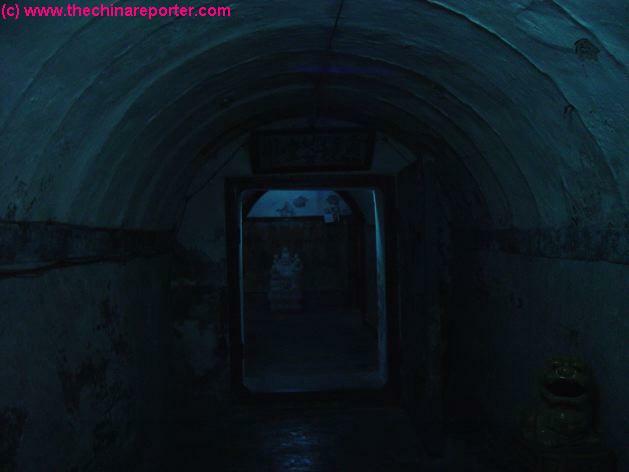 Damp and Dark Tunnels of the Underground City system extend in many directions underneath the Hutong. Ceramic art-piece above the Tunnel Entrance not dating from the Revolutionary Era. This has now been covered up. Luckily, nowadays a Sign has been put up, along with the obligatory Chinese Flag, to show visitors where they want to go. Satellite Image Overview of Chongwen District with location of Underground City and Hutong (in 2002). 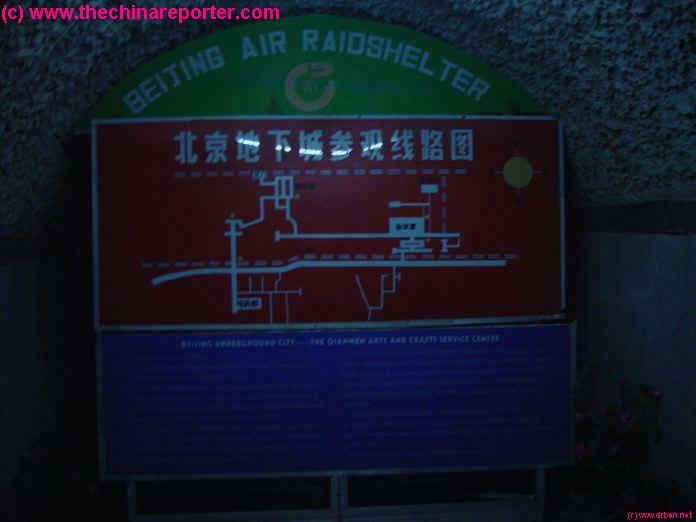 Upon reaching a wider Tunnel that can hold at least a Jeep or a wider vehicle a sign declares Beijing Air Raid Shelters. There is small Map of the site and some explanations. 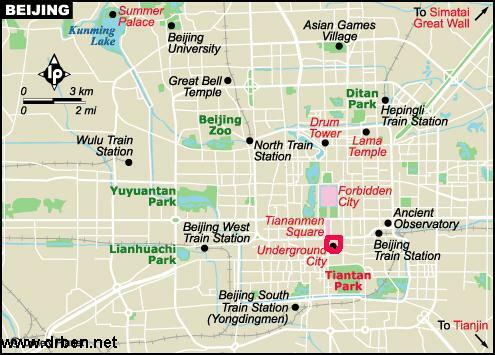 Qianmen are directly linked to the Subway there. As I had already wondered about earlier. Interconnecting tunnels with bends, all similar. Don't get Lost ! 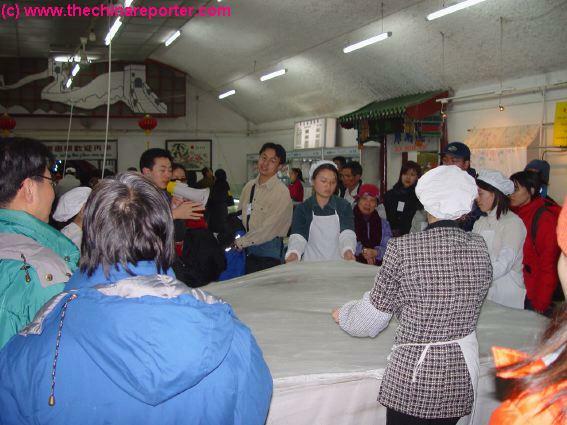 Groups of tourists marvel at a Silk-making Demonstration at the Underground City. In ancient days meant to be used as a Gathering Place for Community Leaders to debate issues of survival and war , in modern days the Room is used and rented by A Silk Store. Even in the Underground City modern China has arrived. 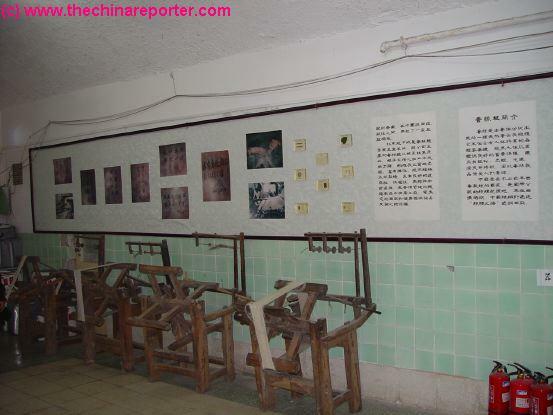 The Meeting Room was rented out to a large and successful Silk Factory from the central Chinese City of Wuxi which put in a Silk-museum and factory. The companies lady-employees put on a delightful display for passing Tourists, while explaining them how Silk is made and asking them to participate in the Process. This often leads to a lot of fun and hilarity, since -apparently- it is all not as easy as it looks. We are taken past the whole silk-making process, which is perhaps a "silly tourist attraction" but on the other hand still an interesting process to witness, study and think about. Now we really know where Silks come from. Everyone can get a hands on experience in silk-making at the Underground Site. remain of the entire Underground Tunnel-complex. The Silk-Factory Stote is housed inside the largest Hall at the Underground Site. Unraveling the single thread from the cocoon without breaking it. Have a Try ? 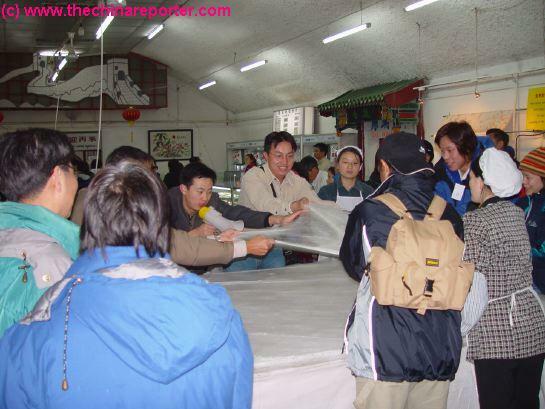 Explanations of the Silk making process. Unfortunatly in Chinese Signs. shield and protect from Nuclear or Chemical Attack. The heavy, slightly corroded door is quite difficult to displace but already open, giving way to a new gray tunnel. The vague shape of a new Boddhisatva appeares from the darkness. Heavy Vault-like Blastdoor and tunnel extending to the Exit. Wild Murals on scathed Walls. (over)correctness inside China among soldiers, red guards, students and other young people. In those paranoid days Taoist and Buddhist shrines were demolished for being "right-wing bourgois-revisionist" and thus against the Revolution of the Peoples and the True Way. A lot of Cultural Heritage Suffered immensely (as an example- red guards even proposed tearing down the Forbidden City, a historic landmark of Feudalism.). So did a lot of the countries intelligentsia ,who were sent to the country-side to "learn from the masses" , and eventually the country of China as a whole. Almost as if underscoring the inability of Leaders to impress themselves on the flowings of Time , what was once considered impossible is again reality today. Old habits have survived the brutal history of the Communist Era and are happily reappearing today. Chairman Mao Portrait hidden in a niche inside the Underground City. more class-destinctions. Not even in cloth or what one was wearing. No private property. Big collectives , political correctness enforced by overzealous Red Guards and of course "volunteering" for sacrificial labor for the State were the other features of life in China and Beijing. 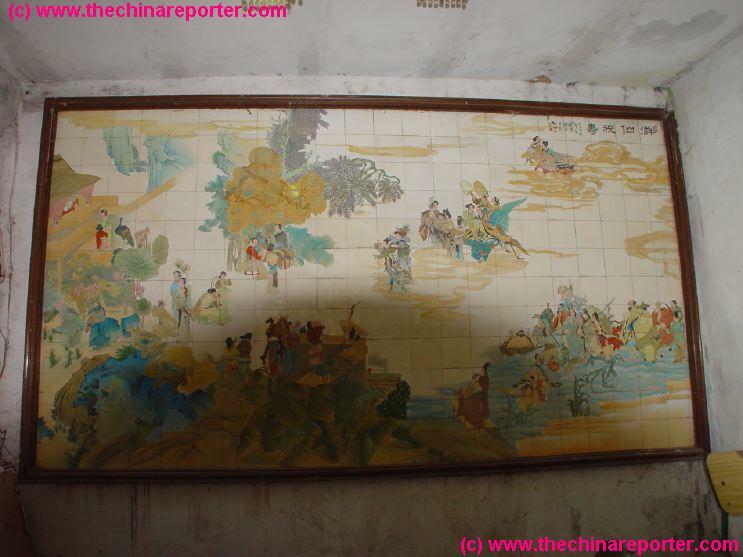 A historical mural at the Underground City site, slowly crumbling in dampness and disrepair. Map of the Hutong south of QianMen DongDajie, including many now demolished. The location of the Underground city in the South-West (bottom-right) is clearly marked. 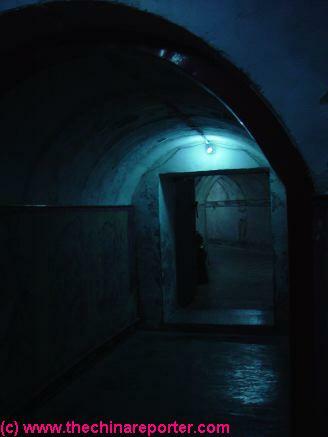 The Underground City remained open in may 2006. The effect of this is that the Underground City has lost 90% of its earlier charm and now is hardly worthwhile your visit. Upon visiting - try and imagine the past and go your own way as much as possible, although a "tourguide" (guard against photography) will be assigned to you whether you like it or not. A Tip - loose yourself in the crowd for a few seconds and get your photos anyway. A local fruit-seller loiters near the Underground City hoping to sell fresh fruit to tourist visitors or locals returning from work (XiDamoChang Jie, Beijing May 2005). A now red carpeted Tunnel in May of 2005. 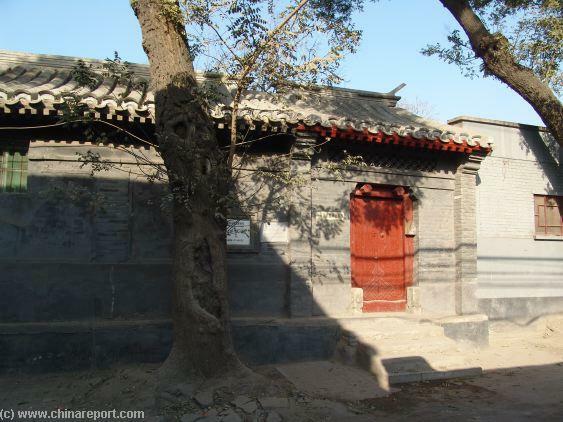 The Hutong above has been slated for demolition and half of it has been leveled already, so it is unclear what will become of the Underground City Museum and other Tunnels. The (former) Entrance from QianMen Dong Dajie' into the QianMen Hutong. Even this, though, does not make the Entrance at all Obvious. Anyone who isn't already familiar with the Hutong and local situation might have a hard time finding it. Make sure you study the photo and route ! Starting due East of Jingshan Park at the corner and Moat of the Forbidden City, the WeSi Jie', Avenue of the May the 4Th Movement stretches Eastward to the China National Art Gallery and Museum. Along its northern length - the small but noteworthy and honored Momument to the Movement of May the 4Th 1919 Ad, when Beijing Students ignited a Nationalist Strife in defense of China and the Chinese Culture. Current Day Beijing is not postered with Political Slogans and colored red by the Flag of the Chinese Revolution. The Face of Mao Zedong is gone, but from the famed Tian An Men, Gate of Heavenly Peace, at TiananMen Square. To travel back to revolutionary years and get a glimpse of the Revolution and the Communist Past one must look carefully. The below listed sites are noteworthy for historic content and may be of your further interest. Visit Beancurd Pond Lane, Mao Zedong's Hutong Residence near the Bell Tower.